Made entirely from vegetable ingredients and designed for organic gardening, Root Juice combines two amazing natural substances: premium humic acid and seaweed. It’s specially formulated to encourage vigorous root development and enhance the natural biological life that surrounds and supports your plant’s root system. Right from the start, Root Juice helps with the initial roots stage as well as the growth of plants that have already rooted. This ensures the plant is better prepared to absorb nutrients more quickly – resulting in a strong, resilient crop and a guaranteed good harvest for all plant breeders. Root Juice is ideal for adding to soil, peat and coco mixes, as well as providing guaranteed root protection with hydroponic or aeroponic systems. If you’re using All Mix or Light Mix substrates, it’s best to feed plants during the first week(s)with Root Juice as this is the crucial time period for healthy rooting. 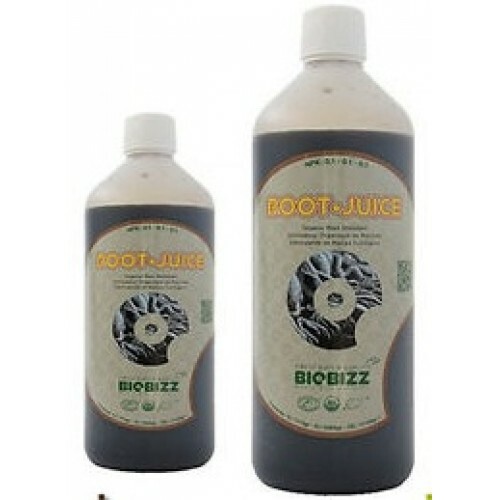 Biobizz recommend a dose of 1 to 4 ml of Root Juice per 1 litre of water. 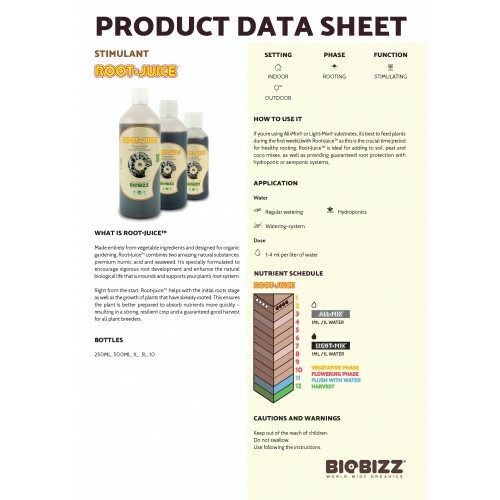 BioBizz Bio Heaven What is Bio Heaven ?BioBizz Bio Heaven improves the effects of all foliar sp..
BioBizz Fish MixWhat is Fish Mix ?BioBizz Fish Mix enables substrates to stimulate bacterial flora a..
1 x Matrix 1.2m x 1.2m x 2.0m1 x Lumii Black 600w Grow Light Kit1 x Powerplant Heavy duty Timer1 x G..